In this post I’ll cover three properties of isogonal conjugates which were only recently made known to me. These properties are generalization of some well-known lemmas, such as the incenter/excenter lemma and the nine-point circle. Let be a triangle with incenter , and let be any point in the interior of . Then we obtain three lines , , . Then the reflections of these lines across lines , , always concur at a point which is called the isogonal conjugate of . (The proof of this concurrence follows from readily from Trig Ceva.) When lies inside , then is the point for which and so on. The isogonal conjugate of is sometimes denoted . Note that . Examples of pairs of isogonal conjugates include the following. The incenter is its own isogonal conjugate. Similarly, each excenter is also its own isogonal conjugate. 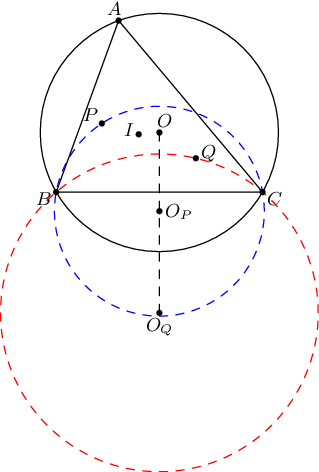 The isogonal conjugate of the circumcenter is the orthocenter. The isogonal conjugate of the centroid is the symmedian point. 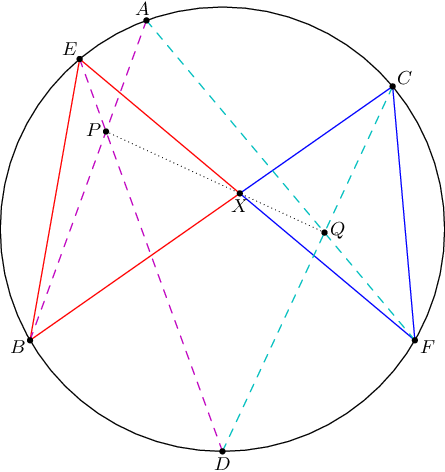 The isogonal conjugate of the Nagel point is the point of concurrence of , , , where is the contact point of the –mixtilinear incircle. The proof of this result was essentially given as Problem 5 of the European Girl’s Math Olympiad. 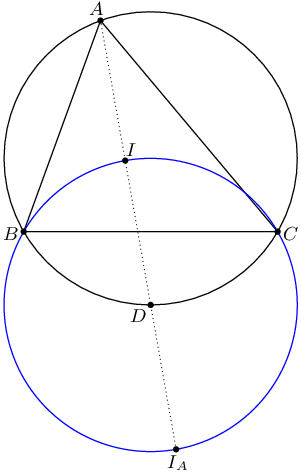 You may already be aware of the famous result (which I always affectionately call “Fact 5”) that the circumcenter of is the midpoint of arc of the circumcircle of . Indeed, so is the circumcenter of triangle , where is the -excenter. In fact, it turns out that we can generalize this result for arbitrary isogonal conjugates as follows. Theorem 1 Let and be isogonal conjugates. Then the circumcenters of and are inverses with respect to the circumcircle of . Similarly, . But the reader can check that . Using this we can show that , so , as needed. When we take and to be (or ), we recover the Fact 5 we mentioned above. When we take to be the orthocenter and to be the circumcenter, we find that the circumcenter of is the inverse of the circumcenter of . But the inverse of the circumcenter of is the reflection of over . Thus we derive that and have circumcircles which are just reflections over . You may already be aware of the nine-point circle, which passes through the midpoints and feet of the altitudes of . In fact, we can obtain such a circle for any pair of isogonal conjugates. 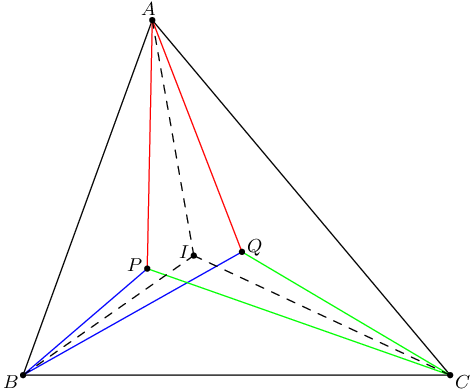 Theorem 2 Let and be isogonal conjugates in the interior of . 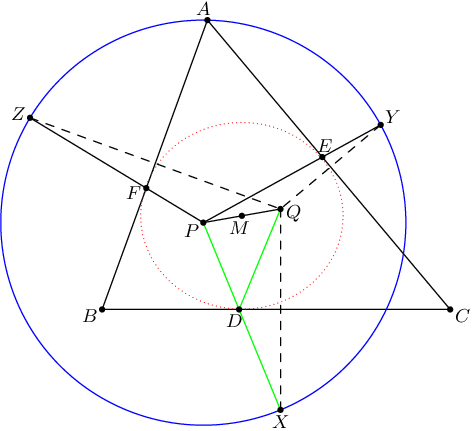 The pedal triangles of and share a circumcircle. Moreover, the center of this circle is the midpoint of . Upon taking and we recover the nine-point circle. Of course, the incircle is the special case ! Similarly work with the other vertices shows that is indeed the desired circumcenter. There is a second way to phrase this theorem by taking a homothety at . 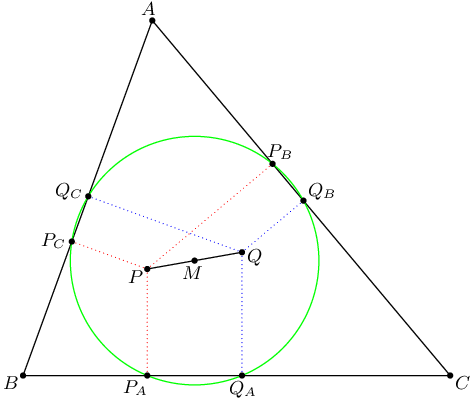 Corollary If the point is reflected about the sides , , and , then the resulting triangle has circumcenter . We can actually derive the following remarkable result from the above theorem. Theorem 3 An ellipse is inscribed in triangle . Then the foci and are isogonal conjugates. Of course, the incircle is just the special case when the ellipse is a circle. So is the circumcenter of . Hence is the isogonal conjugate of . The converse of this theorem is also true; given isogonal conjugates and inside we can construct a suitable ellipse. Moreover, it’s worth noting that the lines , , are also concurrent; one proof is to take a projective transformation which sends the ellipse to a circle. Using this theorem, we can give a “morally correct” solution to the following problem, which is IMO Shortlist 2000, Problem G3. and the lines , , and are concurrent. Proof: Because and are isogonal conjugates we can construct an ellipse tangent to the sides at , , from which both conditions follow. For more on isogonal conjugates, see e.g. Darij Grinberg. I’ll just leave off with one more nice application of isogonal conjugates, communicated to me by M Kural last August. Theorem 4 (Pascal) Let by a cyclic hexagon, as shown. Suppose , and . Then points , , are collinear. Proof: Notice that , though the triangles have opposite orientations. Because , and so on, the points and correspond to isogonal conjugates. Hence , which gives the collinearity. Thanks to R Alweiss and heron1618 for pointing out a few typos, and Daniel Paleka for noticing a careless application of Brianchon’s theorem.